My view of the US economy is for continued modest expansion. Our proprietary Astor Economic Index was essentially unchanged for the month and still showing that the US is solidly in an expansion. Today’s employment report was almost exactly as expected with 215 thousand net jobs added and a steady unemployment rate of 5.3%. These are the solid, gradual improvement in the economy we have seen since 2013. Nobody’s view of the state of the economy or the likelihood of rate hike should have changed with this report. Nevertheless, be prepared to dodge the think pieces on the Fed as September’s meeting approaches. 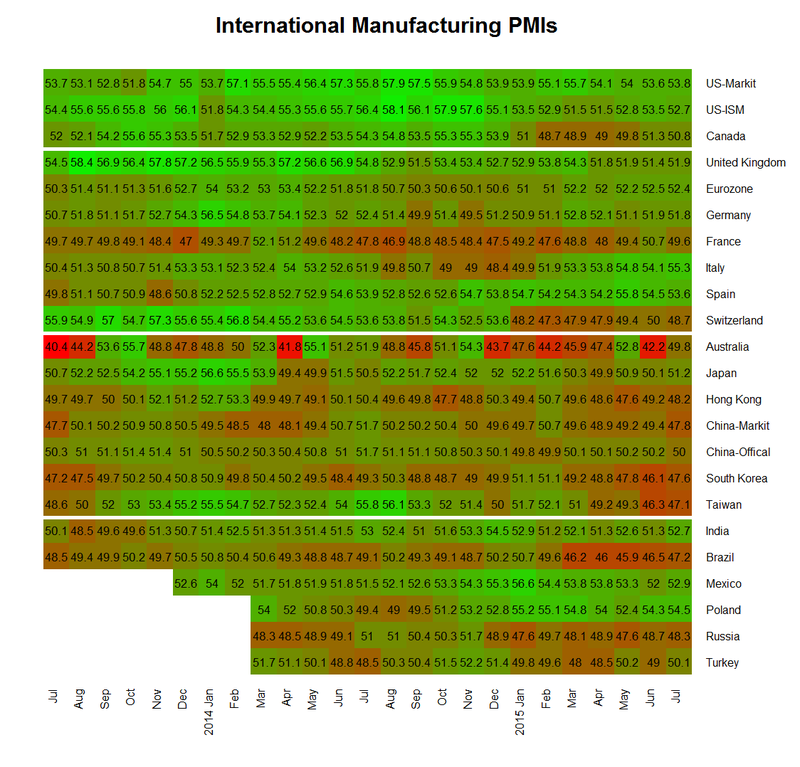 On the negative growth side of the ledger the primary story is the apparent weakness in China. Chinese economic statistics are widely thought to be unreliable but what we can see makes me nervous. If we look at the purchasing managers indexes for China they are at or near multi year lows and showing flat or decreasing orders. We see the same thing in areas which are highly exposed to Chinese orders: Hong Kong, Taiwan, South Korea and Australia for example. Chinese weakness is also a possible explanation for broader weakness in commodity prices. Led by oil, which were one of the more dramatic market developments last month. The rule of thumb used to be “when the US sneezes, the rest of the world catches a cold.” How contagious is China today? One worrying sign is that the volume of world trade (as measured by CPB Netherlands Bureau for Economic Policy Analysis) is showing an unusual contraction, at least through the latest report for May. Most areas are seeing contractions in volumes of imports and exports and more severe drops in the value of imports and exports. (The drop the value of trade is magnified by lower commodity prices.) While widespread, the drops are most severe in emerging Asia. 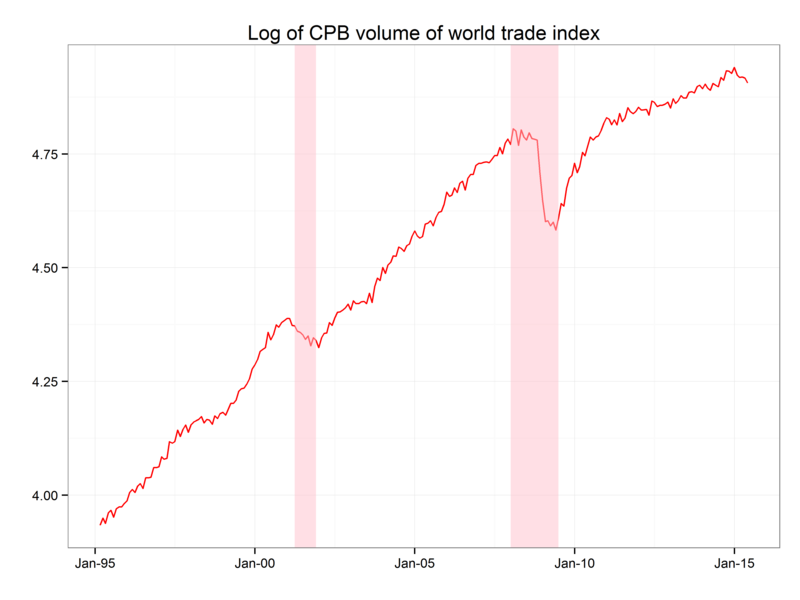 The chart below shows the CPB volume of trade index with US recessions highlighted in pink. It will be interesting to see the reaction of the US economy if this decline continues. As can be seen in the chart sustained downturns in world trade have been associate with the last two recessions, though obviously a recession in the US would be expected to decrease world trade so causality is murky. Overall, I see decent US growth but some worrying overseas developments. This entry was posted in John Eckstein and tagged economic commentary, Employment, international, john eckstein. Bookmark the permalink.